All BAF members receive a 10% discount at Pro Tackle. Check Sponsors section for location. Doug Jones and Matt Hoffert showing off the 11.63lbs winning sack. 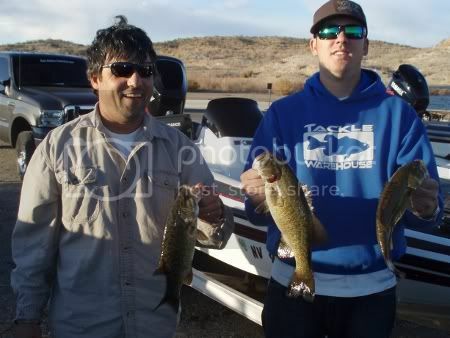 Bass Anglers Federation kicked off the 2012 season at Temple Bar, Lake Mead on January 7. Don Hill launched the 11 teams at 6:20am to clear skies. The day started at a cool 38 degrees with little to no wind; warming to the low 60s and 20mph+ winds hitting Temple Bar just before weigh-in. Taking third place was the team of Jason Randell and James Cope. The two of them brought 2 fish to the scale for 5.57lbs. Second place plaques will go to Matt Lisiewski and Alan Zamora. They fought a faulty trim motor forcing them to stay close to Temple Bar and at the end of the day weighed in 3 fish for 5.89lbs. Matt said "We had to stay close and worked all the points we could get to and caught all are fish with custom made jigs"
First place money went to Doug Jones and Matt Hoffert, with five keepers and two short fish. Doug said "We worked points around Temple Bar and some to the North...We fished between 5-15 feet and did not have to 'fizz' any of our fish. All are fish came on jigs and Texas-rigged worms." Brent Becker showing the winning big fish a 4.51lb Largemouth. Congratulation to Doug Jones and Matt Hoffert for a dominating win. Billy Snyder and James Cope show off there 11.99lbs including a 4.59lb Largemouth winning big fish. On December 10, 2011 Bass Anglers Federation launched out of Echo Bay Marina. After watching a Lunar Eclipse ten teams met at tires to get the day started. After a cool morning with temperatures in the high 30s the weather turned out great. There was light wind and a high of about 58 degrees a great day to be on the lake. After a day of fishing all the teams met up to see how the day went. Most teams struggled with only one team bringing a limit to the scales. Here is how everyone stacked up. 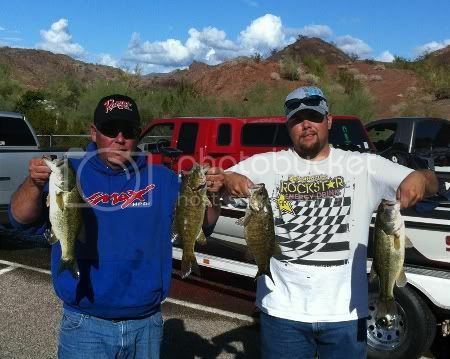 Third place went to Toby Robinson and Alan Zamora weighing in 4 fish @ 7.74lbs with a 2.93 Smallmouth Bass big fish. Second place team was new club members Jason Randell and Jason Burchfield. They brought 4 fish to the scales weighing 9.09lbs with a 4.04lb impressive Smallmouth Bass kicker. Smashing the field was the team of Billy Snyder and James Cope. Fishing the points outside Echo bay with jigs and a drop-shot worm catching a limit before 9:30. 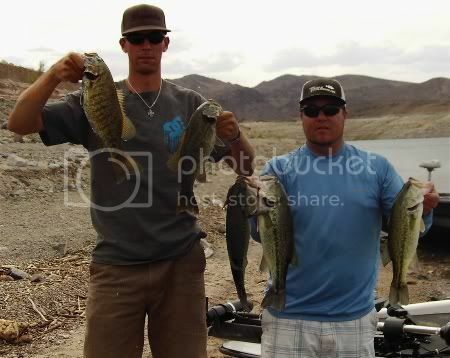 Billy and James brought there best five Bass to the scales weighing 11.99lbs with a big fish of 4.59lbs. Congratulations to Billy and James for winning the tournament. 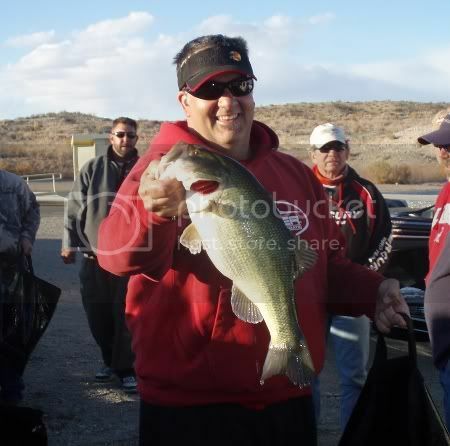 Billy Snyder also won the big fish pot with a 4.59lb Largemouth Bass. 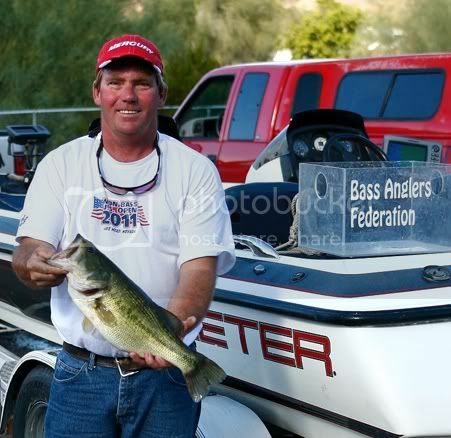 Bass Anglers Federation made the trip to Lake Havasu to hold the 2011 Club Championship. 6 teams made the trip to compete for two days at the Southwests best fishery. Mother nature cooperated well treating anglers to near perfect fall weather with temp in the mid 60s. 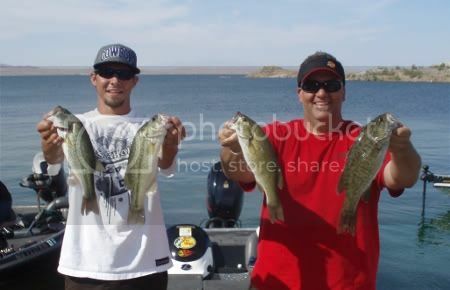 With the water temps hovering around 61 degrees most found the fishing tough for Lake Havasu. Gary and Curtiss take the early lead. At the end of Day 1 Gary Freeman and Curtiss Easter served notice they had a solid pattern that produced 11 keepers with the best five weighing 11.13lbs. 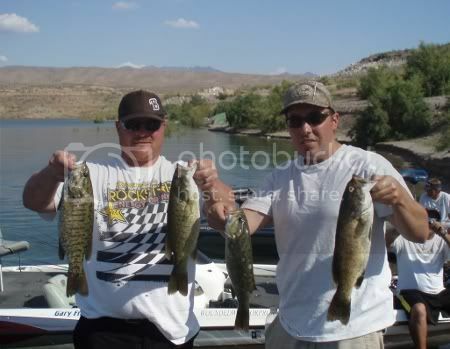 Gary and Curtiss weighed in a nice 3.90lb Smallmouth Bass. Joe Raftery and new member Justin Cambell stood in second place with 10.45lbs including a solid 5.31lb Largemouth Bass taking the lead in the big fish option. Don Hill and Matt Hoffert came to the scales with nice 4.28lb Smallmouth Bass helping them hold down third place with a total of 7.60lbs. Day 2 started out cloudy after some overnight showers sent some campers into the cab of their trucks. After the teams launched some of the teams bites died while other found some nice fish. After 2 days of fishing it was Doug Jones and Randell Bruce taking third place with a two day total of 13.52lbs. 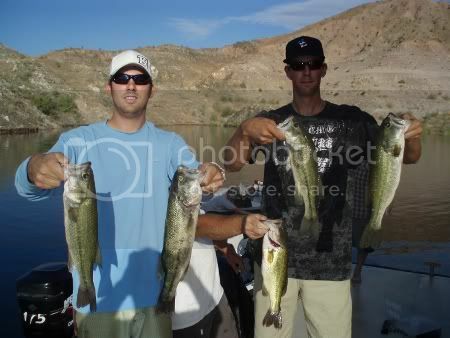 Don and Matt showing their day 2 catch. Finishing in the second spot was the team of Don Hill and Matt Hoffert adding 9.59lbs to there day 1 catch. 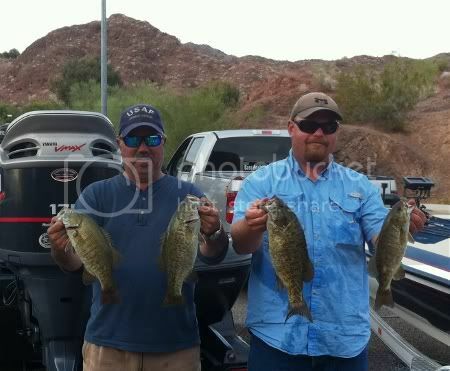 Don and Matt ended up with 17.19lbs with the day 1 Smallie as a kicker. Joe Raftery and Justin Cambell pull some last second heroics to take the win catching a solid 4.34lb Largemouth in the final minutes to steal the win from Don and Matt. Joe and Justin added 9.19lbs to their day 1 total. Their two day weight was 19.64lbs including the 5.31lb Largemouth from day 1. Taking the big fish option was Paul Hemsley weighing in a 5.75lb Largemouth. Matt Warner and James Cope showing 4 of their 5 winning bass. Bass Anglers Federation wrapped up the regular points season at Echo Bay. Following a windy night the weather switched on and anglers were treated with near perfect morning. Nine boats lined up at the tires just before dawn to enjoy a great day on Lake Mead. On the line was two Angler of the Year titles in both Boater and Non Boater classes with three anglers in the hunt for each class. At the weigh in Most boats weighed in a limit of bass with Brent Becker and John Hans taking Third place with 5 bass weighing 8.56lbs. Finishing in Second was Greg Cyphers and Bob Keck weighing in 5 bass at 9.65lbs. 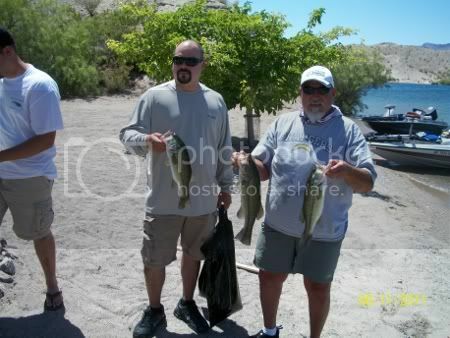 Greg also won big fish with a 2.81lb largemouth bass. Matt Warner and James Cope weighed in 5 bass at 9.73lbs taking a very close win by 8/100ths of a pound. After a close season the Angler Of the Year races were concluded with Brent Becker winning the Boater class and Bob Keck winning the Non-boater class. 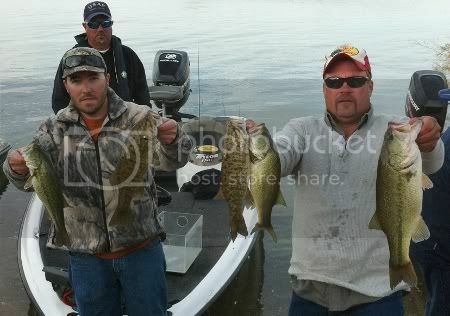 2011 BAF Angler of the Year Brent Becker and John Hans show their catch. Congratulations to all the winners at this months tournament. Matt Lisiewski and Cody Robison showing a solid limit. 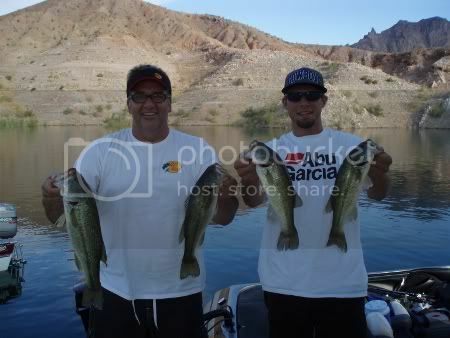 Bass Anglers Federation held the July tournament at Callville Bay. Eight boats line up at 7pm for our first night tournament of the year. Anglers launched with temp hovering around 109 and light wind, most heading towards the narrows. After 12 hours of fishing everyone met up to see who had the best luck. 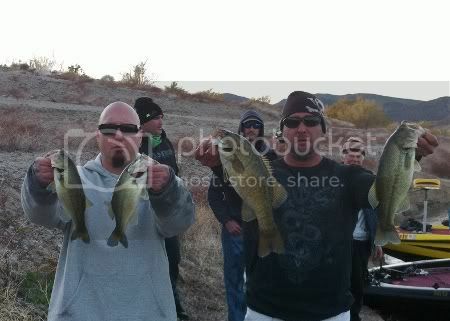 In the mourning it was Gary Freeman and Matt Hoffert landing in third place with 2 fish at 5.13lbs. Coming in second was Brent Becker and John Hans bringing a limit to the scales weighing 8.72lbs with a big fish of 3.5lbs. Taking the win this month was new member Matt Lisiewski and Cody Robison landing a solid limit of 11.16lbs and big fish of 3.36lbs. Congratulations to Matt and Cody for taking the win. Brent Becker and John Hans showing most of the second place bag. 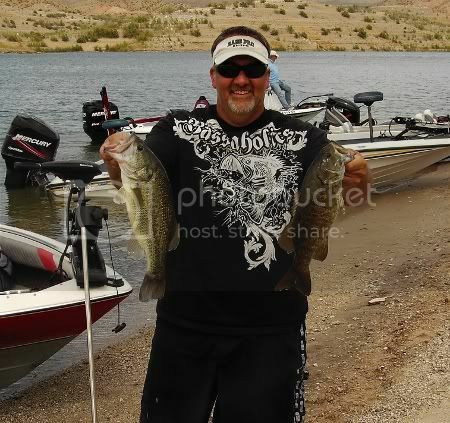 Bass Anglers Federation held its June Tournament at Lake Mohave launching from Cottonwood Cove. 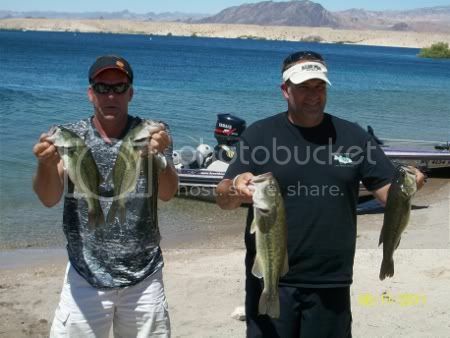 We had seven teams come to Lake Mohave to in the wind and the waves. Early morning wind was calm send a few teams south to try and get a big bite. The wind stayed away for most of the morning but showed up good around 11:00am, blowing 20 - 25 mph the rest of the day. Everyone had a safe day making it bake to the weigh-in with out any big problems. After the bags were weighed Paul Hemsley and Matt Hoffert came home in third place with 3 fish tipping the scales at 7.55lbs. Second Place went to Gary Freeman and Alan Zamora with a limit of bass weighing 11.49lbs including the winning big bass at 5lbs even. 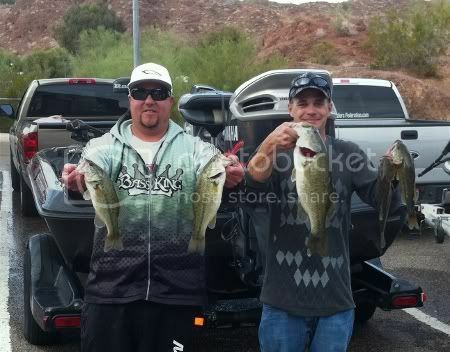 First place went to the team of Brent Becker and Bob Keck bringing in five bass weighing 14.04lbs. 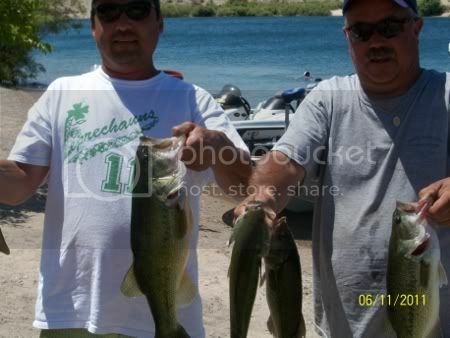 Alan Zamora and Gary Freeman show there bass with winning Big Fish of 5lbs. 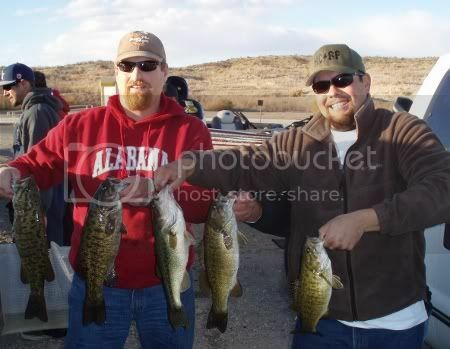 Sam Shiers and Larry Holona show us there bass. Congratulations to Brent and Bob for the June tournament win. We lost a few boaters and nonboaters but picked up a few just before Saturday. The weather was perfect in the morning and the fishing was on fire. Of course this is Lake Mead and the wind never blows out there, by noon we had a 15 - 20 mph wind out of the South so those who ran out of Echo bay had to deal with some rough water. All said and done everyone weighed fish and it was a good turnout. Sam Schiers and Tom Martin show us their fish.